Apple Sales International and Apple Operations Europe are two Irish incorporated companies that are fully-owned by the Apple group, ultimately controlled by the US parent, Apple Inc. They hold the rights to use Apple's intellectual property to sell and manufacture Apple products outside North and South America under a so-called 'cost-sharing agreement' with Apple Inc. Under this agreement, Apple Sales International and Apple Operations Europe make yearly payments to Apple in the US to fund research and development efforts conducted on behalf of the Irish companies in the US. These payments amounted to about US$ 2 billion in 2011 and significantly increased in 2014. These expenses, mainly borne by Apple Sales International, contributed to fund more than half of all research efforts by the Apple group in the US to develop its intellectual property worldwide. These expenses are deducted from the profits recorded by Apple Sales International and Apple Operations Europe in Ireland each year, in line with applicable rules. The two tax rulings issued by Ireland concerned the internal allocation of these profits within Apple Sales International (rather than the wider set-up of Apple's sales operations in Europe). Specifically, they endorsed a split of the profits for tax purposes in Ireland: Under the agreed method, most profits were internally allocated away from Ireland to a "head office" within Apple Sales International. This "head office" was not based in any country and did not have any employees or own premises. Its activities consisted solely of occasional board meetings. Only a fraction of the profits of Apple Sales International were allocated to its Irish branch and subject to tax in Ireland. The remaining vast majority of profits were allocated to the "head office", where they remained untaxed. Therefore, only a small percentage of Apple Sales International's profits were taxed in Ireland, and the rest was taxed nowhere. In 2011, for example (according to figures released at US Senate public hearings), Apple Sales International recorded profits of US$ 22 billion (c.a. €16 billion) but under the terms of the tax ruling only around €50 million were considered taxable in Ireland, leaving €15.95 billion of profits untaxed. As a result, Apple Sales International paid less than €10 million of corporate tax in Ireland in 2011 – an effective tax rate of about 0.05% on its overall annual profits. In subsequent years, Apple Sales International's recorded profits continued to increase but the profits considered taxable in Ireland under the terms of the tax ruling did not. Thus this effective tax rate decreased further to only 0.005% in 2014. On the basis of the same two tax rulings from 1991 and 2007, Apple Operations Europe benefitted from a similar tax arrangement over the same period of time. The company was responsible for manufacturing certain lines of computers for the Apple group. The majority of the profits of this company were also allocated internally to its "head office" and not taxed anywhere. The Commission's investigation has shown that the tax rulings issued by Ireland endorsed an artificial internal allocation of profits within Apple Sales International and Apple Operations Europe, which has no factual or economic justification. As a result of the tax rulings, most sales profits of Apple Sales International were allocated to its "head office" when this "head office" had no operating capacity to handle and manage the distribution business, or any other substantive business for that matter. Only the Irish branch of Apple Sales International had the capacity to generate any income from trading, i.e. from the distribution of Apple products. Therefore, the sales profits of Apple Sales International should have been recorded with the Irish branch and taxed there. This decision does not call into question Ireland's general tax system or its corporate tax rate. Furthermore, Apple's tax structure in Europe as such, and whether profits could have been recorded in the countries where the sales effectively took place, are not issues covered by EU state aid rules. If profits were recorded in other countries this could, however, affect the amount of recovery by Ireland (see more details below). The Commission has set out in its decision the methodology to calculate the value of the undue competitive advantage enjoyed by Apple. In particular, Ireland must allocate to each branch all profits from sales previously indirectly allocated to the "head office" of Apple Sales International and Apple Operations Europe, respectively, and apply the normal corporation tax in Ireland on these re-allocated profits. The decision does not ask for the reallocation of any interest income of the two companies that can be associated with the activities of the "head office". The Commission can only order recovery of illegal state aid for a ten-year period preceding the Commission's first request for information in this matter, which dates back to 2013. Ireland must therefore recover from Apple the unpaid tax for the period since 2003, which amounts to up to €13 billion, plus interest. 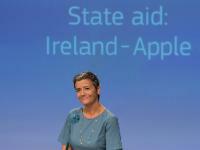 Around €50 million in unpaid taxes relate to the undue allocation of profits to the "head office" of Apple Operations Europe. The remainder results from the undue allocation of profits to the "head office" of Apple Sales International. The recovery period stops in 2014, as Apple changed its structure in Ireland as of 2015 and the ruling of 2007 no longer applies. The amount of unpaid taxes to be recovered by the Irish authorities would be reduced if other countries were to require Apple to pay more taxes on the profits recorded by Apple Sales International and Apple Operations Europe for this period. This could be the case if they consider, in view of the information revealed through the Commission’s investigation, that Apple's commercial risks, sales and other activities should have been recorded in their jurisdictions. This is because the taxable profits of Apple Sales International in Ireland would be reduced if profits were recorded and taxed in other countries instead of being recorded in Ireland. Since June 2013, the Commission has been investigating the tax ruling practices of Member States. It extended this information inquiry to all Member States in December 2014. In October 2015, the Commission concluded that Luxembourg and the Netherlands had granted selective tax advantages to Fiat and Starbucks, respectively. In January 2016, the Commission concluded that selective tax advantages granted by Belgium to least 35 multinationals, mainly from the EU, under its "excess profit" tax scheme are illegal under EU state aid rules. The Commission also has two ongoing in-depth investigations into concerns that tax rulings may give rise to state aid issues in Luxembourg, as regards Amazon and McDonald's.